This article is about the plant. For other uses, see Ginger (disambiguation). Ginger (Zingiber officinale) is a flowering plant whose rhizome, ginger root or ginger, is widely used as a spice and a folk medicine. It is a herbaceous perennial which grows annual pseudostems (false stems made of the rolled bases of leaves) about a meter tall bearing narrow leaf blades. The inflorescences bear pale yellow with purple flowers and arise directly from the rhizome on separate shoots. Ginger is in the family Zingiberaceae, to which also belong turmeric (Curcuma longa), cardamom (Elettaria cardamomum), and galangal. Ginger originated in Island Southeast Asia and was likely domesticated first by the Austronesian peoples. It was transported with them throughout the Indo-Pacific during the Austronesian expansion (c. 5,000 BP), reaching as far as Hawaii. Ginger was also one of the first spices exported from the Orient, ginger arrived in Europe during the spice trade, and was used by ancient Greeks and Romans. The distantly related dicots in the genus Asarum are commonly called wild ginger because of their similar taste. The English origin of the word, “ginger”, is from the mid-14th century, from Old English gingifer, from Medieval Latin gingiber, from Greek zingiberis, from Prakrit (Middle Indic) singabera, from Sanskrit srngaveram, from srngam “horn” and vera– “body”, from the shape of its root. The word probably was readopted in Middle English from Old French gingibre (modern French gingembre). 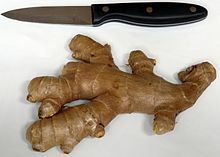 Ginger originated from Island Southeast Asia. It is a true cultigen and does not exist in its wild state. The most ancient evidence of its domestication is among the Austronesian peoples where it was among several species of ginger cultivated and exploited since ancient times. The other notable gingers they also cultivated included turmeric (Curcuma longa), white turmeric (Curcuma zedoaria), and bitter ginger (Zingiber zerumbet), among others. The rhizomes and the leaves were used to flavor food or eaten directly. The leaves were also used to weave mats. Aside from these uses, ginger had religious significance among Austronesians, being used in rituals for healing and for asking protection from spirits. They were also used in the blessing of Austronesian ships. Ginger was carried with them in their voyages as canoe plants during the Austronesian expansion, starting from around 5,000 BP. They introduced them to the Pacific Islands in prehistory, long before any contact with other civilizations. Reflexes of the Proto-Malayo-Polynesian word *laqia is still found in Austronesian languages all the way to Hawaii. They also presumably introduced it to India along with other Southeast Asian food plants and Austronesian sailing technologies, during early contact by Austronesian sailors with the Dravidian-speaking peoples of Sri Lanka and South India at around 3,500 BP. It was also carried by Austronesian voyagers into Madagascar and the Comoros in the 1st millennium CE. From India, it was also carried by traders into the Middle East and the Mediterranean by around the 1st century CE. They were primarily grown in southern India and the Greater Sunda Islands during the spice trade, along with peppers, cloves, and numerous other spices. Ginger produces clusters of white and pink flower buds that bloom into yellow flowers. Because of its aesthetic appeal and the adaptation of the plant to warm climates, it is often used as landscaping around subtropical homes. It is a perennial reed-like plant with annual leafy stems, about a meter (3 to 4 feet) tall. Traditionally, the rhizome is gathered when the stalk withers; it is immediately scalded, or washed and scraped, to kill it and prevent sprouting. The fragrant perisperm of the Zingiberaceae is used as sweetmeats by Bantu, and also as a condiment and sialagogue. In 2016, global production of ginger was 3.3 million tonnes, led by India with 34% of the world total. Nigeria, China, and Indonesia also had substantial production. Ginger produces a hot, fragrant kitchen spice. Young ginger rhizomes are juicy and fleshy with a mild taste. They are often pickled in vinegar or sherry as a snack or cooked as an ingredient in many dishes. They can be steeped in boiling water to make ginger herb tea, to which honey may be added. Ginger can be made into candy or ginger wine. Mature ginger rhizomes are fibrous and nearly dry. The juice from ginger roots is often used as a seasoning in Indian recipes and is a common ingredient of Chinese, Korean, Japanese, Vietnamese, and many South Asian cuisines for flavoring dishes such as seafood, meat, and vegetarian dishes. Fresh ginger can be substituted for ground ginger at a ratio of six to one, although the flavors of fresh and dried ginger are somewhat different. Powdered dry ginger root is typically used as a flavoring for recipes such as gingerbread, cookies, crackers and cakes, ginger ale, and ginger beer. Candied ginger, or crystallized ginger, is the root cooked in sugar until soft, and is a type of confectionery. Fresh ginger may be peeled before eating. For longer-term storage, the ginger can be placed in a plastic bag and refrigerated or frozen. In Indian cuisine, ginger is a key ingredient, especially in thicker gravies, as well as in many other dishes, both vegetarian and meat-based. Ginger also has a role in traditional Ayurvedic medicine. It is an ingredient in traditional Indian drinks, both cold and hot, including spiced masala chai. Fresh ginger is one of the main spices used for making pulse and lentil curries and other vegetable preparations. Fresh ginger together with peeled garlic cloves is crushed or ground to form ginger garlic masala. Fresh, as well as dried, ginger is used to spice tea and coffee, especially in winter. In south India, “sambharam” is a summer yogurt drink made with ginger as a key ingredient, along with green chillies, salt and curry leaves. Ginger powder is used in food preparations intended primarily for pregnant or nursing women, the most popular one being katlu, which is a mixture of gum resin, ghee, nuts, and sugar. Ginger is also consumed in candied and pickled form. In Japan, ginger is pickled to make beni shōga and gari or grated and used raw on tofu or noodles. It is made into a candy called shoga no sato zuke. In the traditional Korean kimchi, ginger is either finely minced or just juiced to avoid the fibrous texture and added to the ingredients of the spicy paste just before the fermenting process. In Burma, ginger is called gyin. It is widely used in cooking and as a main ingredient in traditional medicines. It is consumed as a salad dish called gyin-thot, which consists of shredded ginger preserved in oil, with a variety of nuts and seeds. In Thailand’ where it is called ขิง khing, it is used to make a ginger garlic paste in cooking. In Indonesia, a beverage called wedang jahe is made from ginger and palm sugar. Indonesians also use ground ginger root, called jahe, as a common ingredient in local recipes. In Malaysia, ginger is called halia and used in many kinds of dishes, especially soups. Called luya in the Philippines, ginger is a common ingredient in local dishes and is brewed as a tea called salabat. In Vietnam, the fresh leaves, finely chopped, can be added to shrimp-and-yam soup (canh khoai mỡ) as a top garnish and spice to add a much subtler flavor of ginger than the chopped root. 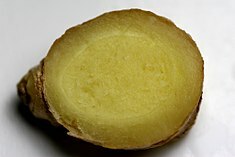 In China, sliced or whole ginger root is often paired with savory dishes such as fish, and chopped ginger root is commonly paired with meat, when it is cooked. Candied ginger is sometimes a component of Chinese candy boxes, and a herbal tea can be prepared from ginger. In the Caribbean, ginger is a popular spice for cooking and for making drinks such as sorrel, a drink made during the Christmas season. Jamaicans make ginger beer both as a carbonated beverage and also fresh in their homes. Ginger tea is often made from fresh ginger, as well as the famous regional specialty Jamaican ginger cake. On the island of Corfu, Greece, a traditional drink called τσιτσιμπύρα (tsitsibira), a type of ginger beer, is made. The people of Corfu and the rest of the Ionian islands adopted the drink from the British, during the period of the United States of the Ionian Islands. In Western cuisine, ginger is traditionally used mainly in sweet foods such as ginger ale, gingerbread, ginger snaps, parkin, and speculaas. A ginger-flavored liqueur called Canton is produced in Jarnac, France. Ginger wine is a ginger-flavored wine produced in the United Kingdom, traditionally sold in a green glass bottle. Ginger is also used as a spice added to hot coffee and tea. Other members of the family Zingiberaceae are used similarly as ginger. They include the myoga (Zingiber mioga), the several types of galangal, the fingerroot (Boesenbergia rotunda), and the bitter ginger (Zingiber zerumbet). Raw ginger is composed of 79% water, 18% carbohydrates, 2% protein, and 1% fat (table). In 100 grams (a standard amount used to compare with other foods), raw ginger supplies 80 Calories and contains moderate amounts of vitamin B6 (12% of the Daily Value, DV) and the dietary minerals, magnesium (12% DV) and manganese (11% DV), but otherwise is low in nutrient content (table). When used as a spice powder in a common serving amount of one US tablespoon (5 grams), ground dried ginger (9% water) provides negligible content of essential nutrients, with the exception of manganese (70% DV). If consumed in reasonable quantities, ginger has few negative side effects. It is on the FDA‘s “generally recognized as safe” list, though it does interact with some medications, including the anticoagulant drug warfarin and the cardiovascular drug nifedipine. The characteristic fragrance and flavor of ginger result from volatile oils that compose 1-3% of the weight of fresh ginger, primarily consisting of zingerone, shogaols and gingerols with -gingerol (1-[4′-hydroxy-3′-methoxyphenyl]-5-hydroxy-3-decanone) as the major pungent compound. Zingerone is produced from gingerols during drying, having lower pungency and a spicy-sweet aroma. Evidence that ginger helps alleviate nausea and vomiting resulting from chemotherapy or pregnancy is inconsistent. There is no clear evidence of harm from taking ginger during pregnancy, although its safety has not been established. Ginger is not effective for treating dysmenorrhea, and there is insufficient evidence for it having analgesic properties due to the lack of well conducted trials. Available data provides weak evidence for its anti-inflammatory role and it may reduce the subjective experience of pain in osteoarthritis. Allergic reactions to ginger generally result in a rash. Although generally recognized as safe, ginger can cause heartburn and other side effects, particularly if taken in powdered form. It may adversely affect individuals with gallstones and may interfere with the effects of anticoagulants, such as warfarin or aspirin. ^ “Zingiber officinale“. Germplasm Resources Information Network (GRIN). Agricultural Research Service (ARS), United States Department of Agriculture (USDA). Retrieved 10 Dec 2017. ^ a b c d e f “Ginger, NCCIH Herbs at a Glance”. US NCCIH. 1 Sep 2016. Retrieved 2 Feb 2019. ^ Sutarno H, Hadad EA, Brink M (1999). “Zingiber officinale Roscoe”. In De Guzman CC, Siemonsma JS. Plant resources of South-East Asia: no.13: Spices. Leiden (Netherlands): Backhuys Publishers. pp. 238–244. 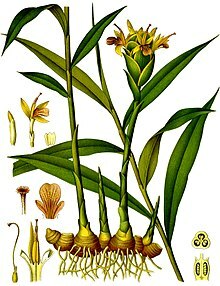 ^ a b “Zingiber officinale Roscoe”. Kew Science, Plants of the World Online. Royal Botanic Gardens, Kew. 2017. Retrieved 25 Nov 2017. ^ “Ginger”. Online Etymology Dictionary. Douglas Harper. Retrieved 22 Jan 2011. ^ Caldwell R (1 Jan 1998). A Comparative Grammar of the Dravidian Or South-Indian Family of Languages (3rd ed.). New Delhi: Asian Educational Services. ISBN 9788120601178. ^ Ravindran P, Nirmal Babu K (2016). Ginger: The Genus Zingiber. Boca Raton: CRC Press. p. 7. ISBN 9781420023367. ^ a b Singh RJ (2011). Genetic Resources, Chromosome Engineering, and Crop Improvement. Medicinal Plants. 6. Boca Raton: CRC Press. p. 398. ISBN 9781420073867. ^ a b Viestad A (2007). Where Flavor Was Born: Recipes and Culinary Travels Along the Indian Ocean Spice Route. San Francisco: Chronicle Books. p. 89. ISBN 9780811849654. ^ Ross M (2008). “Other cultivated plants”. In Ross M, Pawley A, Osmond M. The lexicon of Proto Oceanic: The culture and environment of ancestral Oceanic society. Vol. 3: Plants. Canberra: Pacific Linguistics. pp. 389–426. ISBN 9780858835894. ^ a b Robert B, Trussel S (2013). “The Austronesian Comparative Dictionary: A Work in Progress”. Ocean. Linguist. 52 (2): 493–523. doi:10.1353/ol.2013.0016. ^ Zanariah U, Nordin NI, Subramaniam T (2015). “Ginger Species and Their Traditional Uses in Modern Applications”. Journal of Industrial Technology. 23 (1): 59–70. doi:10.21908/jit.2015.4. ^ a b Dalby A (2002). Dangerous Tastes: The Story of Spices. University of California Press. ISBN 9780520236745. ^ Kikusawa R, Reid LA (2007). “Proto who utilized turmeric, and how?” (PDF). In Siegel J, Lynch JD, Eades D. Language Description, History and Development: Linguistic indulgence in memory of Terry Crowley. John Benjamins Publishing Co. pp. 339–352. ISBN 9789027292940. ^ Mahdi W (1999). “The Dispersal of Austronesian boat forms in the Indian Ocean”. In Blench R, Spriggs M. Archaeology and Language III: Artefacts languages, and texts. One World Archaeology. 34. London: Routledge. pp. 144–179. ISBN 9780415518703. ^ Beaujard P (2011). “The first migrants to Madagascar and their introduction of plants: linguistic and ethnological evidence”. Azania: Archaeological Research in Africa. 46 (2): 169–189. doi:10.1080/0067270X.2011.580142. ^ Doran CF, Dixon C (1991). South East Asia in the World-Economy. Cambridge: Cambridge University Press. ISBN 9780521312370. ^ Watt JM, Breyer-Brandwijk MG (1962). Medicinal and Poisonous Plants of Southern and Eastern Africa. E & S Livingstone. ^ a b “Ginger production in 2016, Crops/Regions/World/Production/Quantity (from pick lists)”. FAOSTAT. FAO, Statistics Division. 2017. Retrieved 8 May 2018. ^ Hardon A, Boonmongkon P, Streefland P, et al. (2001). Applied health research manual: anthropology of health and health care (3rd ed.). Amsterdam: Het Spinhuis. ISBN 9789055891917. ^ Co LL, Taguba YB (1984). Common medicinal plants of the Cordillera region (Northern Luzon, Philippines). Community Health Education, Services and Training in the Cordillera Region (CHESTCORE). ISBN 978-9718640005. ^ a b “Aristolochic Acid: FDA Warns Consumers to Discontinue Use of Botanical Products that Contain Aristolochic Acid”. US FDA. 11 Apr 2001. Archived from the original on 3 Jun 2017. ^ “Nutrition facts for dried, ground ginger, serving size of one tablespoon, 5 grams (from pick list)”. nutritiondata.self.com. Condé Nast. 2014. Retrieved 11 Jun 2017. ^ Spinella M (2001). The Psychopharmacology of Herbal Medications: Plant Drugs That Alter Mind, Brain, and Behavior. MIT Press. p. 272. ISBN 9780262692656. ^ “Code of Federal Regulations, Title 21, Part 182, Sec. 182.20: Essential oils, oleoresins (solvent-free), and natural extractives (including distillates): Substances Generally Recognized As Safe”. US FDA. 1 Sep 2014. Retrieved 21 Dec 2014. ^ Shalansky S, Lynd L, Richardson K, et al. (2007). “Risk of warfarin-related bleeding events and supratherapeutic international normalized ratios associated with complementary and alternative medicine: a longitudinal analysis”. Pharmacotherapy. 27 (9): 1237–47. doi:10.1592/phco.27.9.1237. PMID 17723077. ^ a b An K, Zhao D, Wang Z, et al. (2016). “Comparison of different drying methods on Chinese ginger (Zingiber officinale Roscoe): Changes in volatiles, chemical profile, antioxidant properties, and microstructure”. Food Chem. 197 (Part B): 1292–300. doi:10.1016/j.foodchem.2015.11.033. PMID 26675871. ^ a b Giacosa A, Morazzoni P, Bombardelli E, et al. (2015). “Can nausea and vomiting be treated with ginger extract?” (PDF). Eur. Rev. Med. Pharmacol. Sci. 19 (7): 1291–6. ISSN 1128-3602. PMID 25912592. ^ Lee J, Oh H (2013). “Ginger as an antiemetic modality for chemotherapy-induced nausea and vomiting: A systematic review and meta-analysis”. Oncol. Nurs. Forum. 40 (2): 163–170. doi:10.1188/13.onf.163-170. ISSN 0190-535X. PMID 23448741. ^ Matthews A, Haas DM, Mathúna DP, et al. (2015). “Interventions for nausea and vomiting in early pregnancy”. Cochrane Database Syst. Rev. (9). CD007575. doi:10.1002/14651858.cd007575.pub4. PMID 26348534. ^ Ernst E, Pittler MH (2000). “Efficacy of ginger for nausea and vomiting: a systematic review of randomized clinical trials”. Br. J. Anaesth. 84 (3): 367–371. doi:10.1093/oxfordjournals.bja.a013442. PMID 10793599. ^ Pattanittum P, Kunyanone N, Brown J, et al. (2016). “Dietary supplements for dysmenorrhoea”. Cochrane Database Syst. Rev. 3 (3). CD002124. doi:10.1002/14651858.CD002124.pub2. PMID 27000311. ^ Terry R, Posadzki P, Watson LK, et al. (2011). “The use of ginger (Zingiber officinale) for the treatment of pain: A systematic review of clinical trials”. Pain Medicine. 12 (12): 1808–18. doi:10.1111/j.1526-4637.2011.01261.x. PMID 22054010.